Certified by ANSI S3.19&CE EN352-1, our over-the-head ear muffs are engineered to work in harsh environments. Two layers of professional noise dampening foam, high sealing solid cup and the unique double-shell are used, all combined to achieve an industry leading 34dB NRR. WARRANTY: includes a 45 days money back & 18-month worry-free guarantee! ▶ NRR SOUND TECHNOLOGY, ANSI S3.19 & CE EN352-1 CERTIFIED: SNR 35dB / NRR 34dB (Noise Reduction Rating), Designed with 2 layers of professional noise dampening foam, high sealing solid cup and the unique double-shell,Lab tested and certified to US and European standards. ▶ REDUCE THE NOISE AROUND YOU: The safety ear muffs can be used as a great ear protection for shooting, hunting, indoor gun range, racing, reading, concert, studying and operating machinery to protect hearing, especially suitable for work in construction and landscaping work. ▶ ONE SIZE FITS ALL: Designed with retractable stainless steel at the end of headband, the one size fits all. It is easy to fold and unfold these earmuffs which makes it fully adjustable for kids through adults. ▶ SOFT AND COMFORTABLE: The earmuffs can bring lightweight and extremely comfortable experience for you. Ergonomically designed double-deck headband stays close to your head without causing pressure. 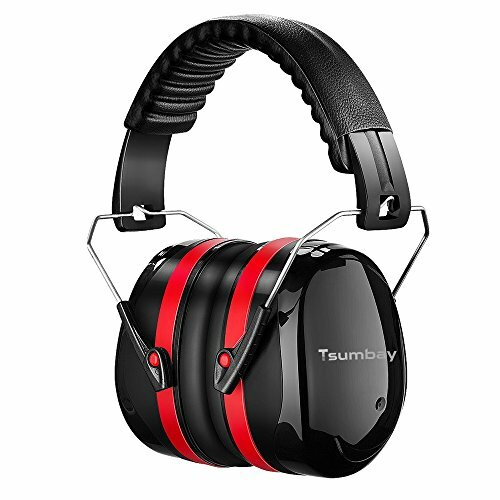 ▶ LONGEST WARRANTY AND SUPER DURABLE: The Tsumbay shooting safety earmuff offers 45 days' money back guarantee and 18 months warranty. PLEASE NOTE: this ear muffs is passive noise isolating and no batteries needed.